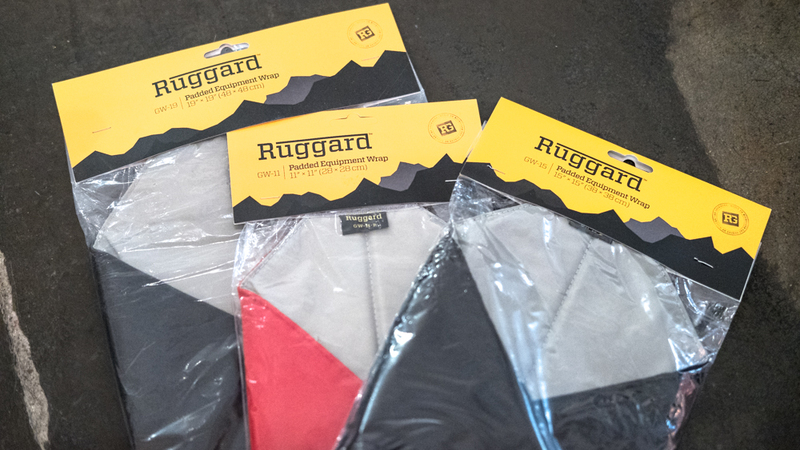 Gear Review: Ruggard Padded Equipment Wraps! Padded and protective wraps have been on the market for more than 10 years now and they’re a fantastic and affordable way to add some protection to your gear, especially when you don’t have a dedicated, protective camera bag. I definitely welcome Ruggard’s padded equipment wraps as a slightly more affordable option to Tenba and Domke’s offerings of protective wraps. If you’re like me, a person on the road a lot that keeps gear light and carries a camera handy 80% of the time but without the rest of the kit, then you’ll enjoy the added peace of mind that comes by way of this padded pancake. I carry a motorcycle backpack everyday, and while it is quite protective for some things like a laptop and my body, the bag can be quite the maraca. MacBook Air, DJI Spark in the case with the  logo, Fujifilm X-T2 and XF-35mm F/2 WR (in the black wrap), Fujifilm XF-90mm F/2 WR (in the red wrap), mandatory Skittles and Bose QC25 Headphones–also a must. Some smaller things in the backpack include chargers, cables and other random knickknacks that are hard and sharp. Those loose items have already left their mark on my precious Fujifilm X-T2 body, sadly. Already, I’m a fan of these wraps. They’re quite thick, and while some may complain about the lack of the ease of wrapping due to it, I like that it creates a lot of cushion for the precious contents. They also come in different sizes for just a bunch of things. In the following, I hope you appreciate my fabric origami, which I find to be quite fun to do. Ruggard Lens Wraps come in different sizes to use 11×11, 15×15 and 19×19, and while I don’t know all of the specs, the different sized wraps seem to be the same thickness. And, they store quite nicely when folded like napkins. The outer fabric that hook and loop fasteners grab onto is quite soft and pretty smooth to the touch. It isn’t going to exfoliate your skin or anything if you rub it against your face. There’s a selection of outer colors, ranging from blue, black, gray, red and yellow. The fabric that is inside is super smooth and isn’t going to damage anything that it touches. I can’t quite name what it feels like, but it has a nylon feel kinda like a tent. The stitching is quite recessed and is quite minimal, leaving a larger amount of surface area for the padding. There are lines that go from corner to corner that you can use to perfect your origami if you’d like. There’s a Ruggard 11x11inch wrap, which nicely wraps a medium sized lens, like my Fujifilm XF-90mm F/2 WR. And there’s a really large one at 19×19, that makes a burrito larger than those at Cafe Rio. I’ve wrapped the X-T2 with the XF-90mm in it. It is also large enough to wrap my 13″ MacBook Pro quite easily, and I’m not sure that it’d fit a 15″ laptop, but there are better ways to protect a laptop anyway– I just did this to show that you could wrap large gear. I can say that I’m mostly positive about this piece of protection, and it starts with the thickness of the padding. It does the job of protecting from objects grinding against each other, and also helps make things more secure if you’re using a Pelican case with the padded grid. I don’t think that it is hard to fold and wrap because of the thickness, personally– and I don’t think the origami skills affect that at all. It also helps that these wraps are priced just below the competition that is out there. They also come in different colors, if you’re into the colored organizing thing that organized people do. The stitching is minimal, recessed and makes for good guides for folding for perfection. Well, there’s only one that I can think of– the quality of the fasteners isn’t super amazing. This is something I can overlook, but some of the corners aren’t cut precisely. It is totally just an aesthetic thing, but it can still irk someone like me. This is more alarming and annoying. I haven’t used them very much, and it looks like the hooks are detaching and getting stuck in the fabric. If you don’t have a dedicated camera bag, what do you use to protect your gear from colliding while in a bag? Would you use this? Let me know!